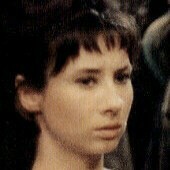 Born in 1940 Carole Ann Ford was only 8 when she appeared in her first film The Last Road. She appeared in various commercials and walk on work before she secured a major role in the film Women of the Streets. Other theatre, television and films followed including the 1963 film The Day of the Triffids and in television on Emergency Ward 10 and the soap opera Compact. After Doctor Who she continued working in theatre as well as playing a schoolteacher in the 1966 film The Great St Trinian's Train Robbery. She returned to Doctor Who as Susan in the 20th anniversary special "The Five Doctors" in 1983 and also in the Children in Need special "Dimensions in Time" in 1993. Susan was The Doctor's first travelling companion. She was also his granddaughter. Because of this she has a very special relationship with The Doctor and her travelling experiences started long before they arrived on Earth. However, the events of "Lungbarrow" revealed that Susan is actually the granddaughter of the Other, a mysterious figure from the dawn of Gallifreyian history who sacrificed himself to create the genetic looms that allowed Gallifrey to continue despite the curse of sterility imposed by their old ruler, the Pythia. One of the last naturally-born children on Gallfirey before the Pythia’s curse sterilised the planet - her mother apparently died giving birth and her father was lost on a bowship fighting the Vampires - Susan was hidden away from the rest of the Time Lords while the Other continued his work, only to be left wandering the streets after he sacrificed himself and she was separated from her guardian while trying to leave Gallifrey. Having been forced to wander the streets for a year following the destruction of the spaceports, Susan encountered the First Doctor when he accidentally travelled back in time to Gallifrey’s distant past after connecting the TARDIS to the Hand of Omega. The two ‘recognising’ each other - despite having never met themselves - Susan subsequently left Gallifrey with The Doctor, who concluded that, even if he didn’t know how he knew her name, he would appreciate her company on his travels. At the start of the television series, the viewer is given the impression that Susan, along with her grandfather, are exiles from their own planet travelling in the TARDIS and that they have lived a rather nomadic lifestyle. In the story "Marco Polo" she announces 'I have had many homes in many places'. Possible it is because of this that The Doctor decided to spend sometime in 20th Century London and so give Susan the opportunity to attend Coal Hill School and it is here that we first see her. The novel "Time and Relative" gave more information on Susan’s life at this time, revealing that, initially after arriving on Earth, The Doctor was almost unable to break the ‘blocks’ his peoples’ rules regarding interference had imposed on his mind, with Susan unable to recall much details about her life on Gallifrey before her departure herself, the ‘blocks’ only lifting when The Doctor was inspired by a young boy who Susan baby-sat for to defeat a being of sentient ice known as the Cold. During this time, Susan befriended a few of her fellow students, but they all went their separate ways after the Cold was defeated, Susan’s friends unable to cope with the truth about her even as they acknowledged that she herself had done nothing wrong. Her outward appearance was that of a fifteen year-old schoolgirl. However, Susan demonstrated on a number of occasions that she was no ordinary teenager - hence the title "An Unearthly Child" of the very first episode. She showed flashes of her grandfather's intelligence and even evidence of non-human mental abilities, on one occasion placing herself in a death-like healing coma when she was injured in the collapse of a building, but more often than not she behaved like any ordinary young person thrust into situations with which she could not hope to deal with. In contrast to her grandfather’s more closed-minded attitude at this point in his life - when he refused to consider such ideas as the TARDIS being alive - Susan was far more open to possibilities, such as when she was the first member of the TARDIS crew to access the ‘magic’ - later revealed to be the result of alien nanotechnology that allowed the user to manipulate their environment - on the seemingly mystical planet of Avalon while imprisoned in an enemy fortress ("The Sorcerer's Apprentice"). Two of Susan's schoolteachers, Barbara Wright and Ian Chesterton, become curious about their pupil's lack of knowledge in some areas and outstanding ability in others. As Ian comments to Barbara 'She lets her knowledge out a bit at a time so as not to embarrass me. That's what I feel about her. She knows more science than I'll ever know'. It becomes clear to them that she is no ordinary fifteen year-old teenager even though she tries to act like one. With her knowledge being extremely patchy and because some of the answers she produces seem rather far fetched for the 1960's her two school teachers decide to investigate her home and her grandfather. In doing so they find themselves in the TARDIS ("An Unearthly Child"). Susan was certainly very headstrong and it is also clear that The Doctor holds a deep affection for his granddaughter. He was always protective towards her and was always concerned for her safety. This feeling was not just one sided as there was definitely a strong bond of affection between them and she was able to prompt a gentler, more good-humoured side to him. Whereas The Doctor tried his best to protect and teach Susan it was clear that she felt that she had to be there to care for The Doctor in return. Susan did lack the ability to judge some of the people and situations she found herself in. She had an open mind and she formed friendships very easily. She had great courage and determination, although her bravery sometimes faltered. She could though be stubborn and during one incident she refused to listen to The Doctor who was very concerned for her safety ("The Sensorites"). Despite this, she proved to be a very capable companion when the situation called for it; indeed, a robotic duplicate of Susan - possessing all of Susan’s memories and her personality up to the point where she was created - once voluntarily ‘sacrificed’ herself to pilot a ship that would take the survivors of a dying Earth colony to another planet, despite knowing that the new society would lack the necessary resources to maintain her once they arrived, sacrificing herself to genuinely accomplish something with her life ("City at World's End"). Susan's role was very important when the show started as viewers had no idea who The Doctor was or where he came from. Susan helped to give him a bit more background and a logical reason for his travelling. Susan was also a vital element in the chemistry of the first TARDIS crew and she gave the younger viewers somebody they could relate to. However, Susan was quickly growing up and no longer wished to be treated as a child. The Doctor realised this and he was also aware that unless she found somebody else to care for then neither of them would part company. It was therefore The Doctor's decision for Susan's leaving him and the TARDIS. He achieved this by locking her out of the TARDIS when he realised that she would be better off starting a new life of her own, on Earth, with a resistance fighter who she had fallen in love with ("The Dalek Invasion of Earth"). (It has been suggested that The Doctor wanted Susan to leave after the events of "The Time Travellers", when he drastically altered Earth’s history by preventing the creation of a renegade time-travel experiment in the twentieth century, finding a safe location for her to remain in order to protect her from the Time Lords if they caught up with him). Much later Susan is reunited with the First Doctor again, along with some of The Doctor's other incarnations and companions in the 20th anniversary special "The Five Doctors". Albeit much older she seemed to have changed very little and she still feels that she still has to protect 'her Doctor', helping him defeat a Dalek and subsequently accompanying him in the exploration of the Death Zone. Despite this, she had very little real interaction with her grandfather’s other selves, due to her twisting her ankle and having to remain in the TARDIS with the Fifth Doctor’s companion Turlough while the various Doctors investigated the crisis with the aid of their other companions. The situation resolved, Susan subsequently departed Gallifrey with the First Doctor, who presumably took her home before continuing on his travels. Susan’s life on Earth was eventually witnessed in greater detail during "Legacy of the Daleks", when the Eighth Doctor, receiving a telepathic scream from her shortly after losing track of his current companion Samantha Jones, attempted to trace the origin of the scream by travelling to Earth to investigate. Since marrying David, Susan had allegedly tried and failed to become pregnant on several occasions, with Time Lord and human interbreeding failing more often than it succeeded. Despite this notable handicap - as well as the fact that Susan, as a Gallifreyan, had barely aged at all since The Doctor left her while David was now in his fifties - the two were apparently happy together, even serving as parents to three orphans whom they had named Ian, Barbara, and David Junior. Working as a Peace Officer to protect the under-populated human race from the remaining Dalek weapons, Susan was captured during an investigation by Estro, the mysterious military advisor to Lord Haldoran, the current ‘ruler’ of England. Investigating Susan’s disappearance, The Doctor learned that ‘Estro’ was actually The Master, seeking control of a Dalek weapon by pitting the two ‘Lords’ of Britain against each other (The situation being made more complicated by the fact that The Doctor had encountered The Master out of sequence; The Master he now faced was the version that had more regularly encountered the Third Doctor). In the subsequent confrontation, The Master had attempted to gain control of a matter transmuter, capable of turning any element into any other element, but was driven off Earth by The Doctor and his allies from the remainders of the original Dalek resistance force, although David died in the struggle when he took a shot intended for The Doctor. The Master tried to take Susan as a hostage, but although he escaped to his TARDIS, he didn’t realise she was also a Gallifreyian until she incapacitated him with a telepathic shriek through his TARDIS’s telepathic circuits. Having disarmed The Master, Susan subsequently left him badly burned and lacking any further regenerations when she destroyed the matter transmuter with his TCE, abandoning him on the distant planet Tersurus before she left with his TARDIS to explore the universe herself. Deciding to leave her to make her own life, The Doctor left Susan to make her own way in the universe, and Susan hasn’t been seen since. Susan’s final fate during the Time War which destroyed both Dalek and Time Lord society is currently uncertain. However, during "The Empty Child/The Doctor Dances" the Ninth Doctor displayed a strong sympathy for Doctor Constantine, who stated ‘Before the war I was a father and a grandfather; now I’m neither, but I am still a doctor’, suggesting that Susan fought and perished in the Time War like so many others of The Doctor’s race. This is the first true sign that Susan is growing up and no longer likes to be treated as a child. She further demonstrated her independence when an android duplicate of her- possessing an exact duplicate of Susan’s mind up to the moment when she was created- chose to help the survivors of the dying planet Sarath escape their world when she was the only person available who could pilot the ship, even though she knew that the resulting civilisation would be unable to sustain her existence ("City at World's End"). In a much later story, The Doctor finally accepts the true Susan’s need to stand on her own, allowing her to go her own way ("The Dalek Invasion of Earth").